Sit back for a bit and I’ll tell you…. Kombucha is this amazingly wonderful and healthy drink that actually has been around for millennia but is making a wonderful re-appearance worldwide. Kombucha is a probiotic as well as a microbiological food. It helps regenerate the bowel flora in the gut, helps with general digestion and over all promotes better health. It is believed to have originated in china thousands of years ago where it was very popular and then it traveled to Russia. Today, it seems to be in many places in the United States like health food stores. Kombucha is actually a fermented tea. If that sounds yucky to you, get ready to be surprised…because it’s not. A ‘pancake’, or SCOBY (Symbiotic Culture of Bacteria and Yeast) is grown in a mix of tea and sugar. 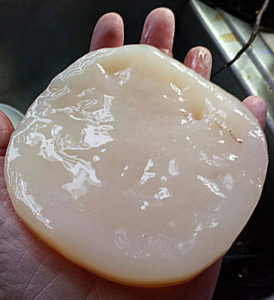 Over time, this ‘pancake’ continues to get stronger and make more pancakes, or SCOBYS. This pancake contains a bundle of micro-organisms embedded that ferment the tea into this delicious and healthy brew of tea. The tea itself is delicious; a mixture of sweet and tangy with a fruity fragrance and taste to it. Once you get hooked on it, then it is goodbye soda! What the Kombucha does is actually feed on the sugar. When the tea is fermented,, the sugar is used in the process while turning the tea into a health drink containing substances the body needs such as amino acides, vitamines, lactic acid, glucuronic acid and so much more. It is generally considered safe for even diabetics to drink. Want to learn more about this delicious beverage? If so, you are on your way to better health and new you! If you are interested in brewing your own Kombucha, visit here to see where I obtained my first SCOBY culture.